I came across the TAYGA aprons, and lets just say these aprons are hip, stylish and anything but boring ! I was excited that I had the chance to review the Allison in blue and brown. The Allison apron as describe on the TAYGA site...this halter apron in luscious colorful prints that put a contemporary spin on a classic, creating a stylish and trendy flair. Banded contrast trim at bottom and pocket trim. I am short any everything always seems to long for me but as you can see in the photos below that the length was fine. Yes you read right it is machine washable, I do not know about you but that is 2 of my favorite words ! I really like how it is reversible, so basically you are getting 2 aprons for the price of one ! Besides TAYGA aprons being a must have for you, they would also make a perfect gift (not to early to think about Christmas) ! With so many styles and colors to pick from on their site, I am sure you will be able to fine that perfect one !!!! BUY: Visit the TAYGA site here. A TAYGA apron of your choice ! 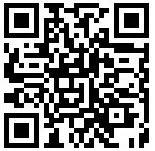 Winner had been emailed, you have 48 hours to reply. They are soooo pretty. The one that catches my eye is the Allison, Item #202. I love that it is reversible and I like both sides. I would get a lot of use out of it. The Alison in either color would be great. I love the The Marilyn (item #101)--so pretty! I just love the Allison. I like the Marilyn Apron in Red. I love the Allison in Red (#202). Very cute! I like the Klaudia apron. I like the Alexis apron! the Samantha - love that fabric! The Allison #203 is my favorite. I love the color combination. I like the Alexis 303 style! Thanks! I like the Alexis apron. Thank you. I like the Marilyn #106. It is bright and cheery. I would love to win my mom the Marilyn apron! The Alexis is really cute! I like the Alexis! Thanks for the giveaway! I think the Allison Apron is great! 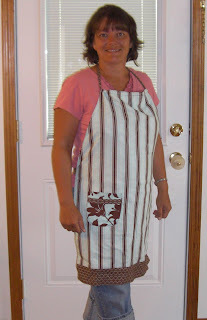 I like The Allison apron Item #203 - just like the one you modeled. I love the Kimberly #402. Thanks for the giveaway! I commented on the Bake Me A Wish Giveaway. I commented on the Oreck Halo Giveaway. I like the Marilyn Apron-Item# 106. I like the Marilyn (item# 101) apron. I like Alexis #303 is my fave. I absolutely LOVE the Alexis apron, its so adorable! Thanks for the giveaway! I like the marilyn. It looks fun and sassy! These are so cute. I love the Alexis. Great colors! The samantha would be my favorite. Love the little pocket. 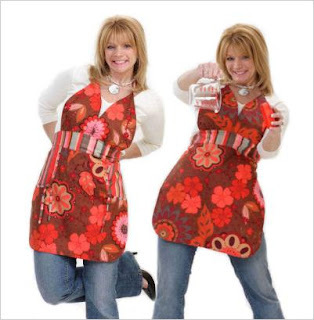 Wow such hip aprons! The Klaudia caught my eye immediately! I like Claudia, item #505. They are all beautiful and it is hard to pick a favorite. I think I really like The Alexis #303. It really suits my personality. I tweeted this contest as NetworkingWitch. I like the Marilyn #101. The Green and Pink Alexis#307. both sides are definitly my style. and machine washable is amazing! They are all so cute! My favorite is The Marilyn multi Item #101. I would choose the "Klaudia" becuase it is fierce! I LOVE the ALLISON one. ADORABLE! I am following your blog (for more reasons than your giveaway too) I have three boys as well no pink in my house too. I like the Allison Item #203! Thanks for the chance! My favorite is the Alexis. The Alexis is my favorite. My fave is the pink & green Alexis apron! The Allison is my favorite! Thanks!! The Klaudia (Item #505) is my favorite. I like the choice between flowers and stripes, the scalloped bottom and the lace trim. I really love the Marilyn. The red and white is super cute and I think the cut is really flattering a lot more so than most aprons. The sweetheart neckline really makes a bid difference in how the cut looks. Love the Alexis - #303. 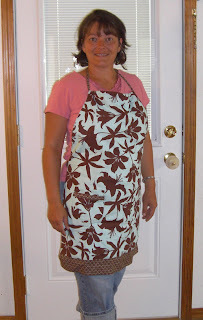 I love the Allison apron.The design is so sweet! I like the lovely red Marilyn apron! I like the marilyn! These are so cool! I like the Alexis apron.